In this article I will explain how to send Gridview as email body in asp.net using C# and VB.NET. In previous article I explained Send HTML file as Email body in asp.net, Send Mail in asp.net, Send mail with images using gmail credentials, Send mail with attachment in asp.net and many articles relating to JQuery, asp.net, SQL Server etc. 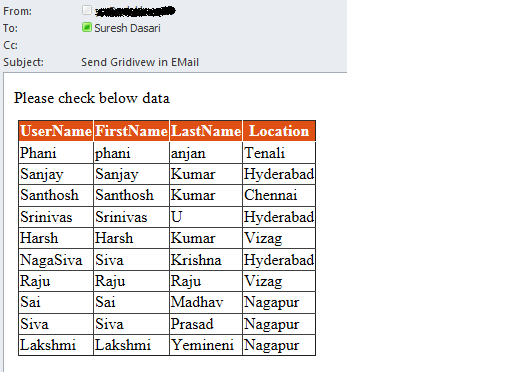 Now I will explain how to send Gridview as email body in asp.net using C# and VB.NET. Msg.Subject = "Send Gridivew in EMail"
Msg.Body += "Please check below data <br/><br/>"
Dim sSmtpServer As String = ""
I have gone through many of your tutorials to ASP.NET and would say that they are amazing to learn something fruitful out of it. I recommend beginners to follow your tutorials. sir can we do socket programming in asp.net ? what these classes do actually & differences strBuilder , strWriter and HtmlTextWriter? sir i want to send listview data to email with image how to do that. sir i am trying to build an web page with gridview and some other details in a web page. how to open attachment in popup window from gridview in asp.net with print button???? can you forward this by daily auto scheduling. where is the authentication for the smtp server? I have used your many codes in my project. These code also work finely. But, i want to use these concept in a c# page which including master page. "Control 'ctl00_Contentplaceholder1_GridView1' of type 'GridView' must be placed inside a form tag with runat=server." And give idea to use these code even the page have include masterpage..
sir how to code for send email of images in grid view. "Control 'GridView1' of type 'GridView' must be placed inside a form tag with runat=server." how can we do this in mvc?